Tough working conditions - but somehow I manage! What's the motivation behind the things I have painted? It's because of the atmosphere I experienced at the time from them. That experience was worth repeating. While painting these, I feel the soft breezes, the balmy waters, I hear the soft lapping of water against the boat, the gentle whoosh! of the sea as it caresses the sand, the birds chirping in their peaceful surrounds. We have some hanging in our home and they greet me when I wake up. A great way to start my day: with a mood lift as from a good friend. The thought that others can gain pleasure from these paintings is rewarding. I really hope they will do the same for you. Most of the time I work from photos I've taken, sometimes from other people's photos that they have given me. I may use most, or some, of what I see in the photos in my paintings, leaving out what I feel may interfere or distract from the atmosphere of the end result. When not using photos as the basis of the painting-to-be I like to do some sketches of the subject in pastel. Before starting to paint I look at the many different sketches I've done, and decide which parts best capture the feeling I am wanting to present. Then I incorporate these into the painting. I am not a fast painter - it can take weeks to finish one because of all the preparation and the detail that goes into them. Since I spend such a lot of time there, I usually only paint places or things that appeal to me. 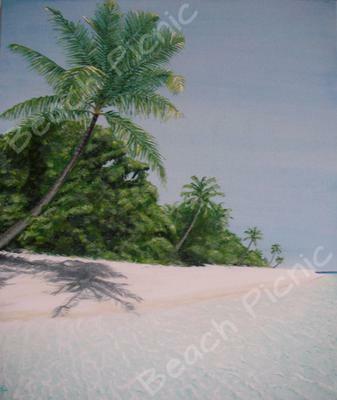 Such as places where I'd like to have a beach picnic! It's personal: everyone has their own choice. Mine is simple: I like acrylic because it works for me. I find it versatile and love the vibrancy. Also, because of my being sensitive to chemicals, I find this medium is more comfortable to work with. But I appreciate the beauty of all other mediums. Click here to return to Art Lovers. 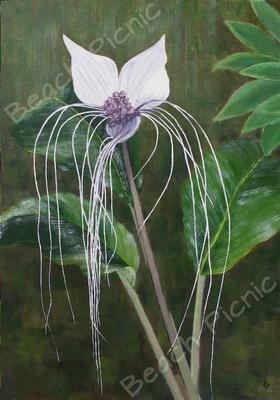 The giclée prints are on archival quality canvas, and I always hand-finish them for added texture. 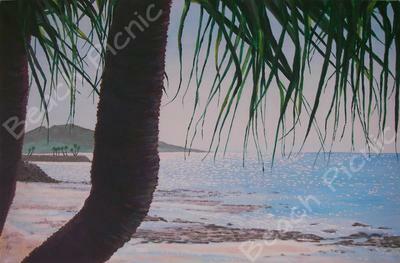 So every one of the giclee prints is a little different, giving it a more personalised feel. This also means you can order a giclee print that is actually larger than the original, but there is not the typical decrease in quality. 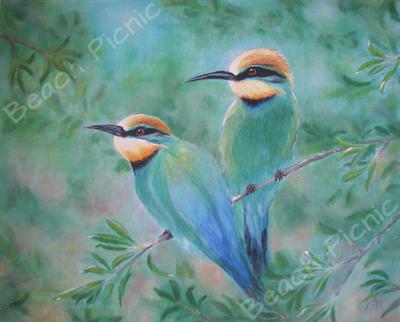 Giclée prints are either stretched on a frame (gallery wrapped) or delivered in a roll. I have sometimes been asked for different sized giclée prints on paper instead of canvas, and I will have these made to order for you, using archival fine art cotton rag paper. I appreciate that everyone's wall space is different. So therefore if these don't suit I can personalise sizes that will accommodate individual needs. There is nothing as disappointing as loving something and not being able to treasure it in a special place. I am open to any suggestions that might help. I have done quite a number of special commissions, but I will only take one on if it's a place where I'd like to spend some time. Feel free to send me a photo to start the discussion. A tranquil mid-afternoon when the intensity of midday has passed. The sun dances playfully on the water, framed by the much-loved Pandanus palm. As my husband and I were relaxing, walking along “The Strand” enjoying the sounds and the smells, the feeling of wanting this moment to slow down for a while and drink this view in more deeply came over me. It was so tranquil. I needed to paint it. Now the moment can be revisited anytime and we can all enjoy its sense of peace, even on a busy day. When looking at this sheltered sea view my instant desire was for a picnic basket with picnic goodies. 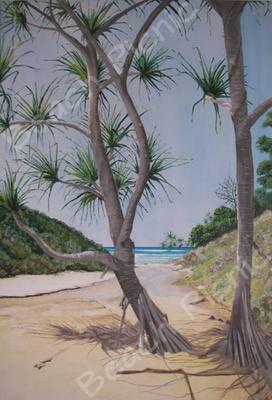 Being able to sit under the Pandanus tree with its sculptural roots. The almost imperceptible flow of the creek moving past. What else do we need?" 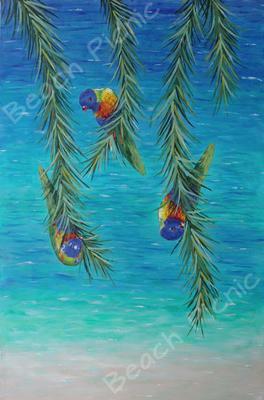 Please see my website www.beachpicnic.com.au for more details or to order. While having a coffee near our tree, lots of lorikeets swooped down into it and started feasting on the flowers. They are such cheeky birds! They were undisturbed by our presence, prattling away softly, leaving us to peacefully enjoy their vibrant suits of colour. A deserted feel... What intrigued me with this place was the deserted feel: the remaining plant life standing proudly, the clearness of the water making it appear shallow, the subtle reflection of the clouds in the water. Also the light play of the ripples. A nice story to put on canvas. A private Island... Who of us has not at one time or another wanted to go to a private island? I was attracted to its beautiful proportions and the large range of colours in the sea. So many things going on in a small area, all of it able to be captured on one canvas. Irresistible! Most of the year we enjoy these bright "jewels." When my husband and I hear their familiar whistle, we excitedly look forward to watching their effortless acrobatics. Or watching their contentment when enjoying a ""sand bath"". It just makes one want to paint. First impressions... Years ago when my husband and I first came to North Queensland, this view was our first impression of the island. It always holds a special place in my heart because of that. I am sure many have had the same experience. A moment on a deserted beach when the water just makes you want to be in it. Who would not enjoy the luxury of being on a lovely clean beach for a while to chill out and refresh! What attracted me here was the delicate pastel blue of the water, the challenge of capturing light play on the sand. There was a great desire to hop out of the boat and become part of this story. 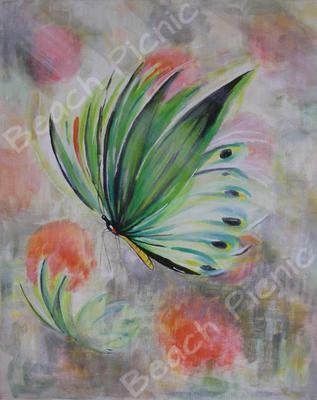 I had never seen these beautiful butterflies before we moved to the Wet Tropics. My first experience of one made me think of opals. I was struck too by the way it flies, particularly when "stalling" it just appears to be drifting in mid-air. I wanted to capture that movement. We planted lots of bushes and trees that they like, to create a "flight path" for our enjoyment. 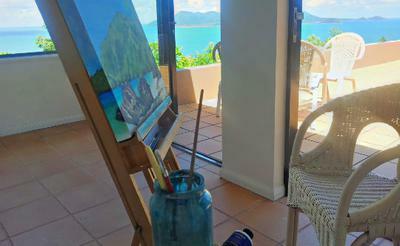 But you can have the painting for yours even if you don't live in the tropics. 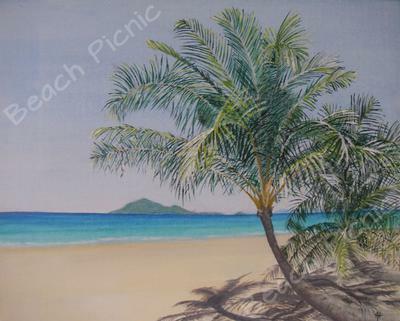 Please see my website www.beachpicnic.com.au to order prints or paintings.